Farming Expired Real Estate. Socrates, one of the greatest "thinkers" of all time said "Action equals knowledge." Action, not thinking, is how we achieve results." Now, let's apply that to Farming Expired Real Estate. 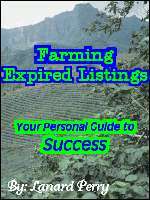 You can think about farming expired listings all you want, but you will never get any listings until you actually do something about them - like writing and mailing expired listing letters, visiting owners of expired listings and perhaps even calling them. And of course the more you farm expired the more proficient you will get at it. The fact of the matter is that you can intellectualize all you want, but until you take action you'll never accomplish anything. The same is true for Farming Expired Real Estate. You'll never experience success until you actually start an expired listing system, but once you do the listings and sales could potentially start rolling in. I'm no longer a licensed agent, but I loved farming expired listings ...and still do. No other lead generating campaign came close to yielding the results as I did farming expired listings. I went from doing things I hated (especially cold calling) to marketing exclusively to known sellers via the use of letters - a much kinder and gentler marketing strategy. Of course expired listing post cards and real estate flyers can be just as effective - I just happened to prefer letters. Farming Expired Real Estate offers many benefits that other marketing strategies don't. For example, the prospects are mostly realtor friendly and often times still want to sell their properties after their listings expire. Consequently, they will be listing their properties with somebody - and maybe even you! The number one rule for effectively marketing expired real estate listings is to establish a process, one whereby you systematically pursue the relisting of them on a regular and ongoing basis. Sending out letters on Friday will not be as effective as sending out letters Monday through Friday. The second rule for effectively farming expired real estate is that farming expireds is not an instant gratification process. It's very likely that it'll take months before you start receiving results, so think of it as your being the tortoise running and winning the race. Slow and steady can be good and sustained. So, be prepared for the mid to long term outlook or don't start at all. I think so, unless you proceed slow and cautiously, because it's too easy to, unintentionally or not, violate the National Do Not Disturb Call List. You've worked too hard to get licensed, so why put it at risk by calling on owners who might be upset enough to invoke the sanctions? Write letters instead! As of this writing you won't be fined for mailing someone an expired listing letter. Plus, the expired letters you send will be around when phone calls are long forgotten. They can be constant reminders of you and the services you offer. However, all expired listing letters are not created equal. So, be careful about the ones you base your marketing success on. Go with proven ones, like these. They were effective for me and are for others still using them. When it's all said and done I think Farming Expired Real Estate is a great marketing strategy for both new and veteran agents. New agents can benefit by doing what others have done, specifically by buying a system, or letter that have worked for others; but hopefully tweaking them and doing it a little bit better. On the other hand, experienced agents can cultivate expired listings to create yet another source of leads and income. The more streams of leads and income the more money you'll make. You can read more about my expired listing system by clicking here!